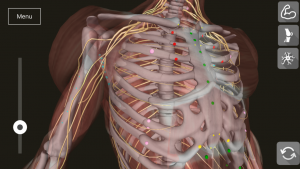 The interconnected state of every system in the body is something that we have all experienced through our work with Fascial Counterstrain. System phenomena type reactions would not really be able to occur unless all tissues related to a system were connected. The degree to which this connected state exists was not fully recognized until just recently when Brian figured out that tenderpoints are connected within systems and furthermore that they occur in highly predictable patterns called chains. The Fascial Counterstrain chain concept that I recently developed, is analogous to the concept of acupuncture meridians. In other words, l found that dysfunctions in all systems, occur in predictable chains with a limited number of dysfunctions in each chain. This concept is extremely valuable to clinicians because it allows you to rapidly identify and remove dysfunction from the body. Start by performing the cranial scan to identify the most involved system and area of the body. Find a severe tender point in that system, identify its chain, then quickly scan all points in the chain . Realize that all tender points in a given chain release, to some extent, simultaneously so you will only need to turn off the most severe two or three points and the entire chain will resolve. Often, one or two chains is all that is needed to clear that entire system. One tip is to quickly scan the tender points in the hands and feet to rapidly identify the involved chain and work back proximally. Don’t forget to balance the other side if you are treating an extremity. I believe these chains are a manifestation of the mechanical concept of biotensegrity in the human body, which is widely recognized to exist in the body’s deep fascia. Utilizing these chains will improve your carryover, speed and effectiveness by at least 30%. Happy hunting!! If you do not already have a Counterstrain.com account, Register Here. After your application has approved, login to your account and click on the 3D Counterstrain tab. You will find a small text link to Download Chains in the light green box at the top of the page. These documents are being made available free of charge to qualified Fascial Counterstrain therapists in an effort to help in the clinical application of Fascial Counterstrain. In addition, the goal is to improve the overall outcomes with the most involved and complex patient populations. Thank you for your interest in Fascial Counterstrain! We hope that this new approach is successful in advancing your clinical application of this amazing technique.